Early start, cold morning, first 10km or so on busy road until we found a radweg (bikepath) along the river Main, then along the Kinzig, a smaller tributary. We have to do our own navigation as the Garmin (GPS) is out of the picture. This is due to an oversight by a member of our party who thought we had all the necessary maps and then found out that we don’t. Getting them is not as easy as you might think, so we are using a combination of Google Maps, a paper map and our powers of observation. Google Maps includes an American woman in Ian’s phone who tells us where to go, but her German pronunciation is so dreadful that we turn her off as much as possible. We found a bicycle route from Hanau (near Frankfurt) in the direction we needed to go. It is well signposted and we managed to follow it fairly easily with only one accidental deviation that took us up an unnecessary hill. The gradient has been good – flat almost all the way through low lying country in the valley of the Kinzig. Scenery has been varied with unsealed sections through forest, grassy meadows, storks wheeling above, herons feeding in the fields, railways, highways and autobahns alongside, cornfields, an asparagus crop, apple trees, wind farms, a Nordic walking club and lots of people walking and cycling. Today’s highlights were the towns of Gelnhausen and Salmunster. 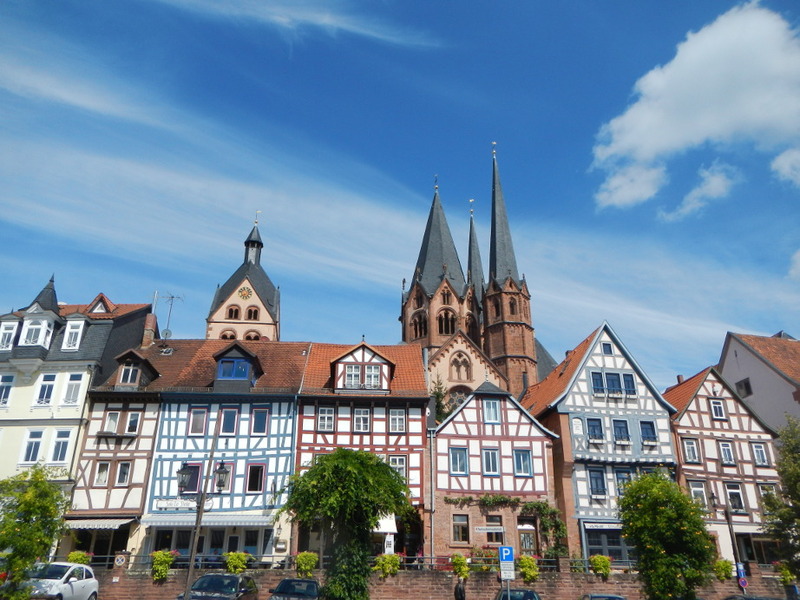 Gelnhausen is a walled city with an impressive steepled church and narrow streets of half-timbered houses. Salmunster’s church of Sts Peter and Paul has an impressive tower and rococo interior. We are now in the small town of Flieden where the friendly young hotel proprietor speaks minimal English, provides no wifi and shrugs helplessly when offered a Mastercard! She serves a good German dinner though. This entry was posted on 20 August 2014 at 6:54 pm and is filed under Europe 2014. You can follow any responses to this entry through the RSS 2.0 feed. You can leave a response, or trackback from your own site. Sadly we are not able to go to Wurzburg, this will have to be another holiday!